Fill a large heavy bottom pot or dutch oven with water – enough to cover most of your head of cabbage. Salt water and bring to a boil. Have a medium bowl of ice water next to stove for shocking. While water is coming to a boil, cut the core out of cabbage and remove and discard outer, darker green leaves. Submerge cabbage in water, core side up. As the cabbage begins to cook, begin to gently pry away the first outer leaf with tongs, being careful not to tear it. It should not tear if it is cooked enough. Once removed, dip in the ice water bath briefly to shock and then place leaf on work space. Continue until you have about 12 (or more) leaves. Reserve remainder to cut up and saute another day. Cut out just a small triangle to remove the thick part of the rib. Dice and add to the meat mixture below. Saute onions until cooked through. In a bowl, combine onions, diced cabbage ribs and the next ingredients through bread crumbs. Divide in to 12 equal sections. Empty water from dutch oven and put full jar of Cannizzaro Marinara or Arrabbiata in. To assemble – Pull cabbage leaf together to overlap the missing triangle and place a portion of the meat mixture on fold. 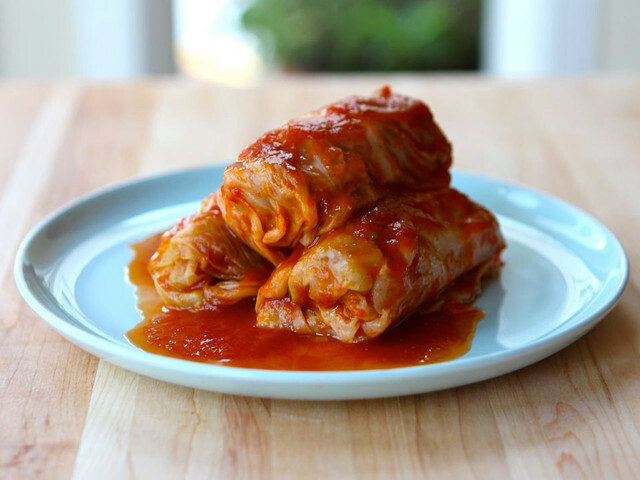 Roll and fold like a burrito and place, seam side down, on top of the sauce. Repeat with remaining leaves. Cover and simmer on low (slow, low boil) for 30-40 minutes. Plate and ladle extra sauce over top. Sprinkle with Parmesan cheese.